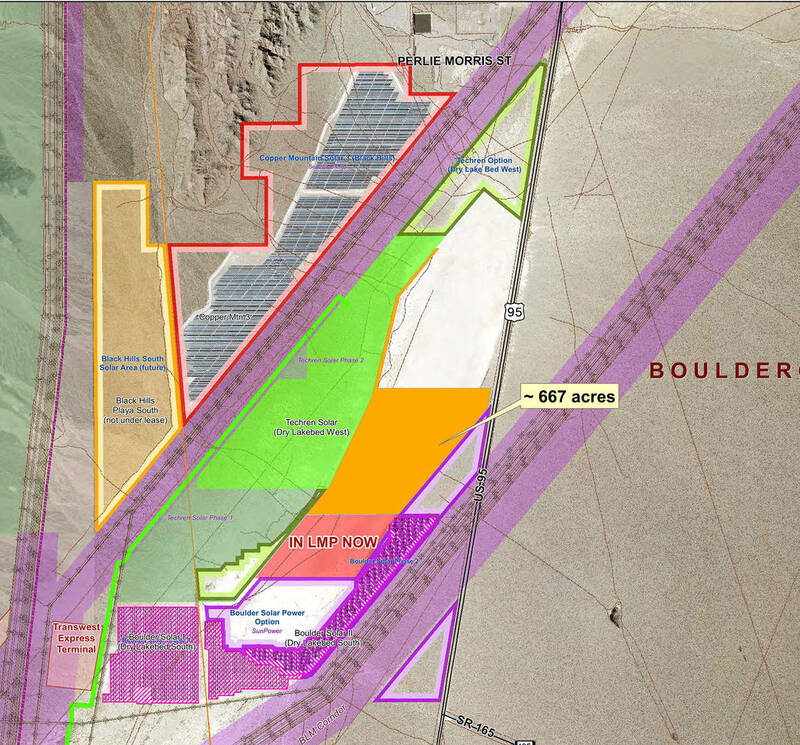 Silver Peak Solar LLC has withdrawn its request to add 667 acres of the dry lake bed in the Eldorado Valley to the land management plan for solar development. On Friday, Jan. 11, Silver Peak Solar LLC withdrew its request to add 667 acres of land in the dry lake bed in the Eldorado Valley to the land management plan for solar development. Council forwarded the request to the Planning Commission in October for consideration. The commissioners recommended it not be added as it would be detrimental to recreational opportunities. Members of the community expressed concern about the limits it would put on recreation. “At this time, we will be focusing on those lands that are under development already, and we are happy to withdraw the land management plan application,” said Larry Greene, project manager for Silver Peak Solar. Silver Peak is the company in charge of the Techren Solar project, which is leasing three parcels in the Eldorado Valley. Greene said the company and Boulder City have a good long-standing working relationship. On Jan. 8, council approved an option agreement for Silver Peak to lease almost 276 acres in the Eldorado Valley that previously was optioned by Korean Midland Power and then transferred to Sun Power. That portion had been in the land management plan since 2008. Throughout the process for the 667 acres, members of the public voiced opposition to allowing that land be used for solar development and not preserved for recreation and other activities. Councilman Warren Harhay said he was happy that Silver Peak listened to the community. “I congratulate them for being sensitive to that,” he said. Harhay said many residents have a personal history with the dry lake bed, and he taught his sons how to drive motorcycles and a stick-shift vehicle there. “The dry lake bed has been a part of our lives, and we want to continue it to be a part of our lives,” he said. Harhay said he is trying to find another location for future solar development that is already in the land management plan but not in the Eldorado Valley. “They’ve been good partners. … We want to give them alternatives,” he said. Councilwoman Peggy Leavitt said she thought it was good that Silver Peak withdrew its request. “I think they realize it was a nonstarter,” she said. Leavitt also said she follows former City Councilman Duncan McCoy’s belief that the dry lake bed should be preserved for its residents and their activities. The land management plan is an ordinance that helps give council a way to deal with land the city owns.